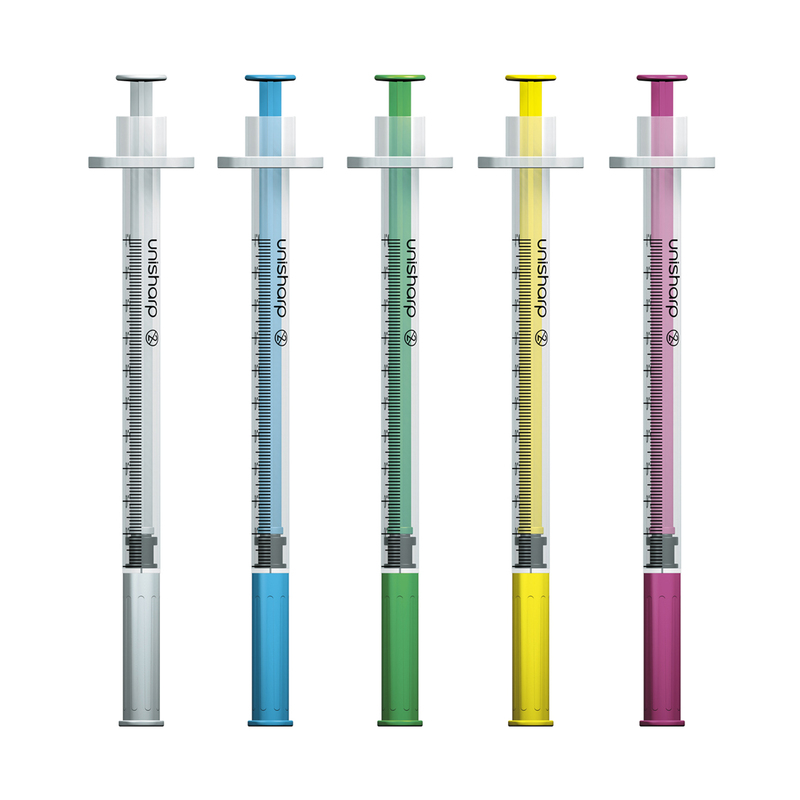 The nevershare fixed needle 1ml syringe has plungers in a range of 5 colours to reduce the risk of accidental sharing. Nevershare 1ml fixed needle syringes are used for injecting both psychoactive drugs like heroin and cocaine, as well as hormones (and other water-based medicines), such as human growth hormone (HGH). 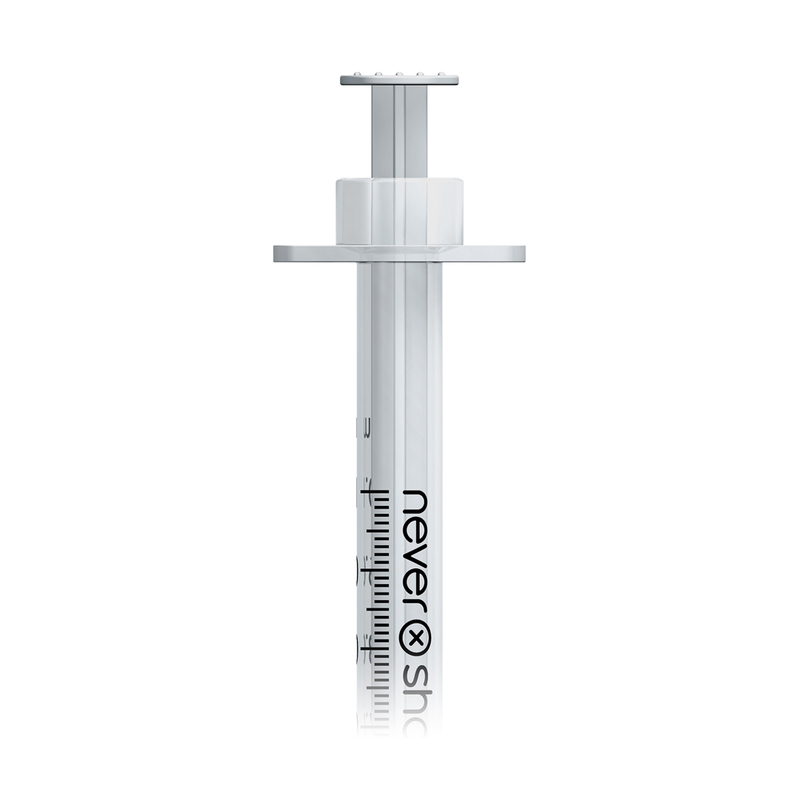 The nevershare syringe is manufactured exclusively for Exchange Supplies by world leading medical device manufacturer, BBraun. 30 gauge needle to minimise vein damage (needle length =12mm / ½in). promoting strategies to prevent accidental sharing. 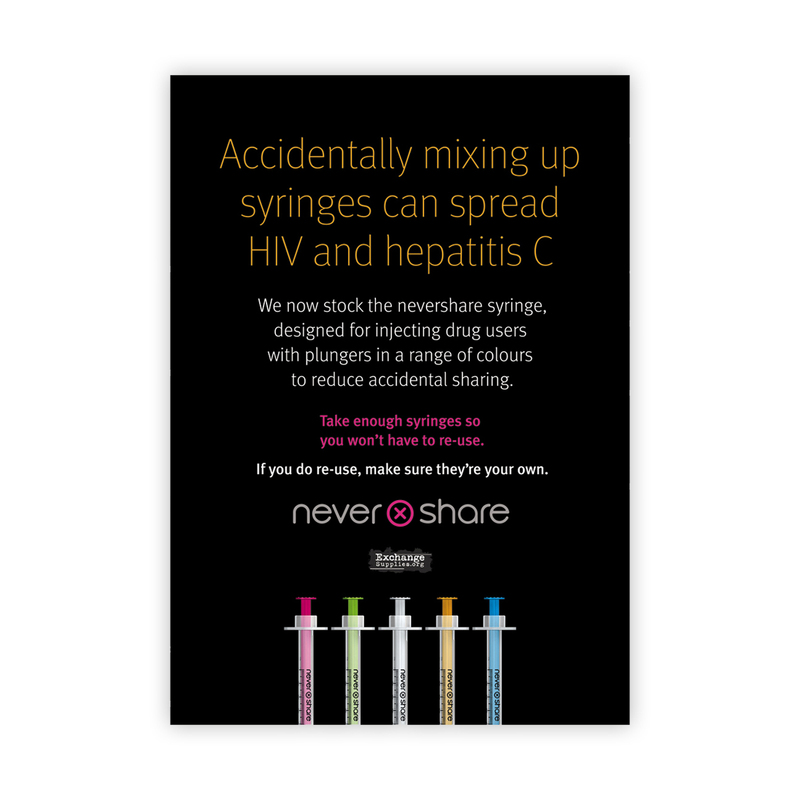 Nevershare syringes are also available from the NHS through e-direct, see Product briefing FAQ's for details. We also sell a full range of separate needles and syringes with all gauges of needle from the 30 gauge 0.5 inch fine yellow needle to the 2 inch 21 gauge long green needle. For ease of ordering, we can supply equal quantities of each colour, and that is what we deliver when you order product code S140 from this page. 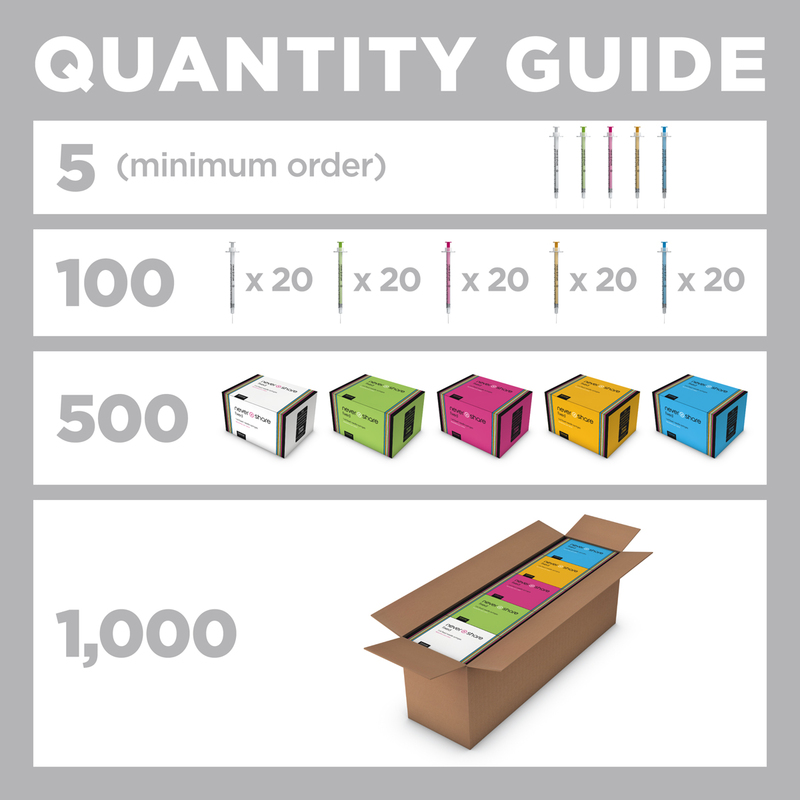 We normally supply services mixed colours in boxes of 1,000 syringes: 200 of each colour, but you can order any number. 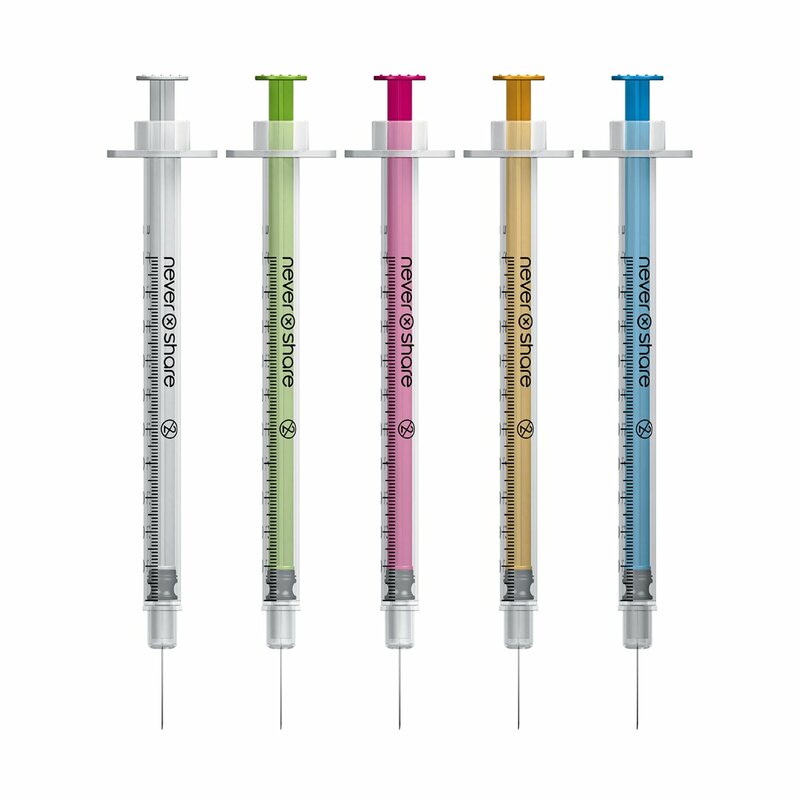 To order via NHS supply chain add the product code FTR601 1ml Nevershare syringe mixed colours to your favourites. The nevershare syringe is manufactured by one of the world's leading syringe manufacturers exclusively for Exchange Supplies. The syringes are assembled on a state-of-the-art, purpose built machine, in a manufacturing facility that has the latest technology and quality assurance systems to ensure that the syringes are of the highest quality. The nevershare needle exceeds the ISO 8537 insulin needle strength standard. 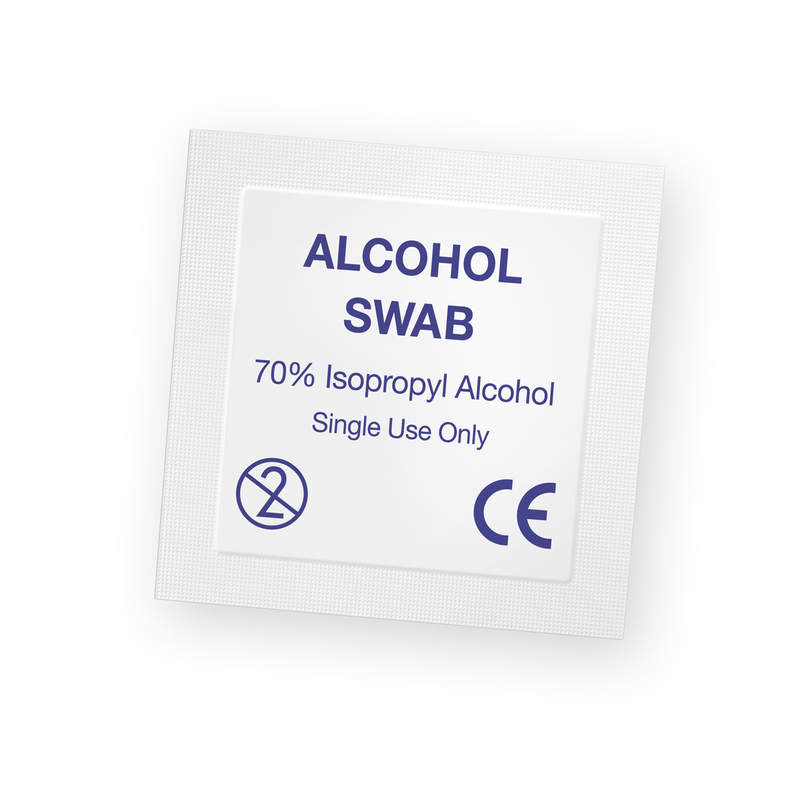 As with all our products the syringes are fully batch controlled and we have the ability to do a selective or full product recall in the unlikely event that it is necessary. The extent of accidental sharing as an issue for blood borne virus transmission was highlighted in a study of injecting risk using video recording that was conducted by Professor Avril Taylor at the University of Paisley. To view the section of the DVD that illustrates the different circumstances that lead to accidental sharing (the risk of which can be reduced by the nevershare syringe) click here to open our youtube channel with the short film about accidental sharing in a new window. 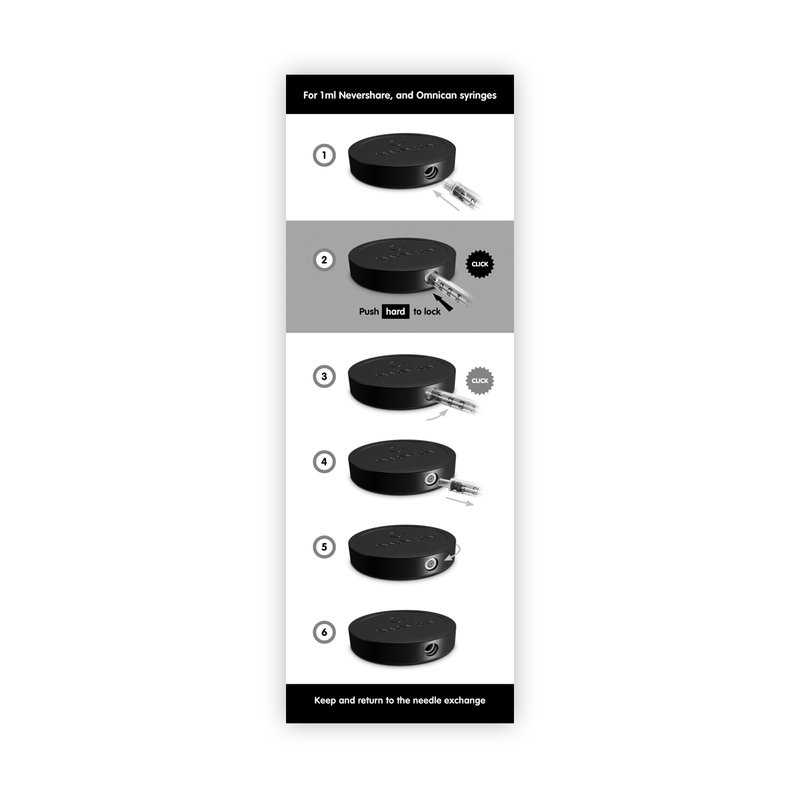 On this page we aim to give you all the information you need to confidently and sucessfully introduce the nevershare syringe in order to maximise the harm reduction benefits of your needle and syringe programme. If you would like us to talk you through the issues on the phone, or visit to discuss how best to manage the changeover, we are always happy to provide support, information and advice to users of our products – full contact details are in the about us section. The FAQ section also has answers to questions asked by drug users and clinicians. Deciding how many different colours someone should take when they come into the needle exchange should be fairly straight forward – it depends on how many people they're picking up for. If they're just collecting for themselves, then they'll normally only take one colour (although they might want to take a few of another colour if other people ever inject around them). A couple would normally pick up two colours, and where people might have a number of other injectors using their equipment they may pick up more of one colour (to use for themselves) and a selection of the other colours. Injecting is an important part of the life of many drug users, and people are often very familiar with, and have brand loyalty to, the syringe they are used to using. 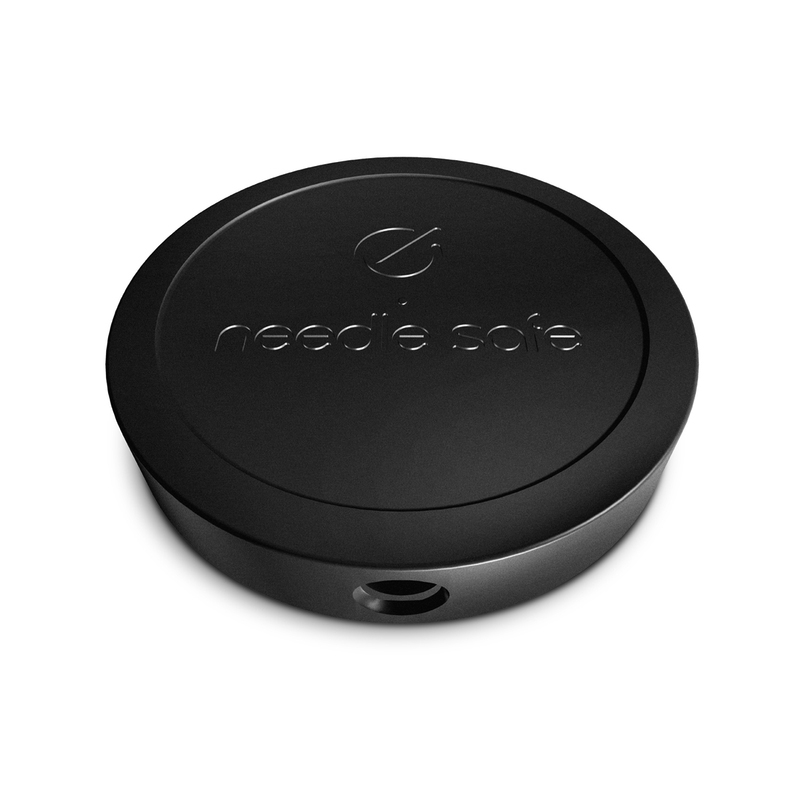 However, the nevershare syringe is not 'just another brand': it's a syringe with substantial potential to reduce sharing. Workers will therefore have to address the issue of changing brand with a balance of enthusiasm for the benefits of the nevershare and sensitivity to the reasons why people might be resistant to change. As with cars, beer, soap powder or anything else where it can be difficult to tell products apart, brand loyalty to syringes is an individual thing. One person's first choice can be someone else's last. Syringe preference is often a local issue, with users in a town or area having the same view as to what's good, and what isn't: in many cases this is the exact opposite to the view held by users in another town or area! This variability of views on syringe brand loyalty means that it is an area that is amenable to intervention and change. In the end the most important benefit of swtching to the nevershare is the potential for reduction in risk of accidental sharing and blood borne virus transmission. In addition, from the point of view of injectors the fact that you are offering an attractive high quality syringe designed for them, should also be a significant attraction. The other attractive useability features of the syringe are a very smooth plunger action and lack of print around the barrel especially at the bottom, so people can see what's going on in the syringe more easily. We are not suggesting that injectors should never be offered choice about the injecting equipment they use – some will need detachable and/or longer needles. However, where people have a preference for other insulin syringes, the benefits they perceive must be weighed against the possible increase in blood borne virus risk from accidental sharing through not having coloured plungers. We are obviously very interested in how these discussions with injectors go, and welcome feedback from workers and injecting drug users. 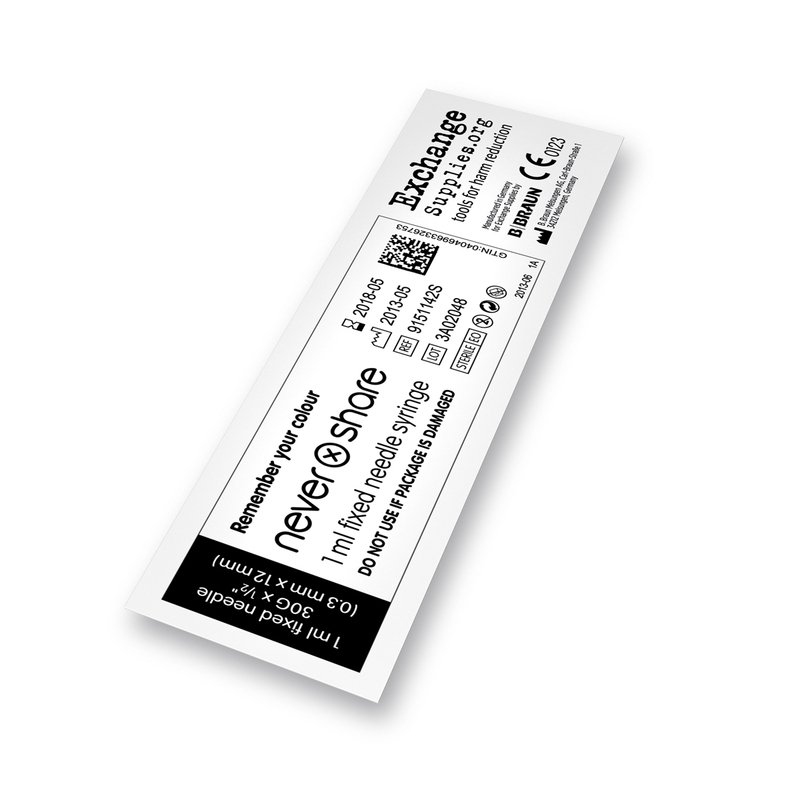 We think that the nevershare syringe can work well in pharmacy needle exchange with both the 'pick and mix' and pre-packed pack systems. Pharmacy providers using packs will get their contract packers to pack packs with 5, 10 or 20 syringes that are the same colour, on the basis that most people are picking up needles and syringes for themselves. The logistics of delivering to pharmacies would probably dictate that users wouldn't be able to stipulate the colour when collecting, If people don't know the colour of the syringes in their pack when they collect it, it shouldn't be a great problem as if the colours are spread evenly across the packs there will be a 1 in 5 chance that two individuals will have the same coloured syringes. However, if it were possible for people to choose a colour it would probably enhance ownership of colour as a differentiator. But, if during consultation with users it is clear that packs are usually being collected for more than one person a system of packing, say, 4 strips of 5 syringes of a different colour in a pack of 20 shouldn't be too difficult for the contract packers to arrange. 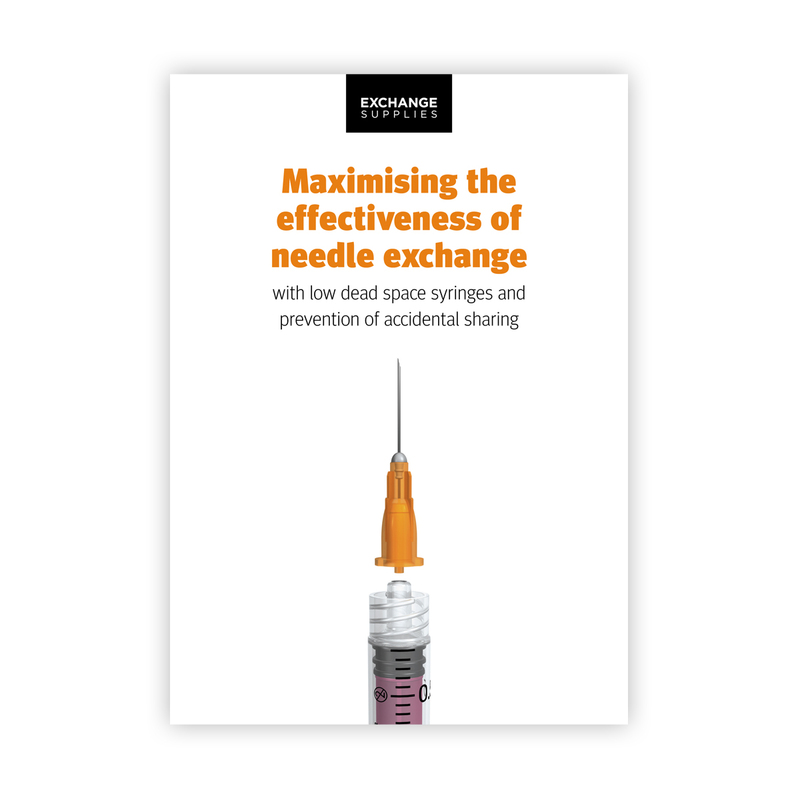 We are happy to use this page as a forum for pharmacy needle exchange coordinators, pharmacists and drug users to share information and experience of using the nevershare syringes in pharmacy needle exchange setting. To reduce damage to the skin and veins to a minimum, injectors should use the smallest possible needle. 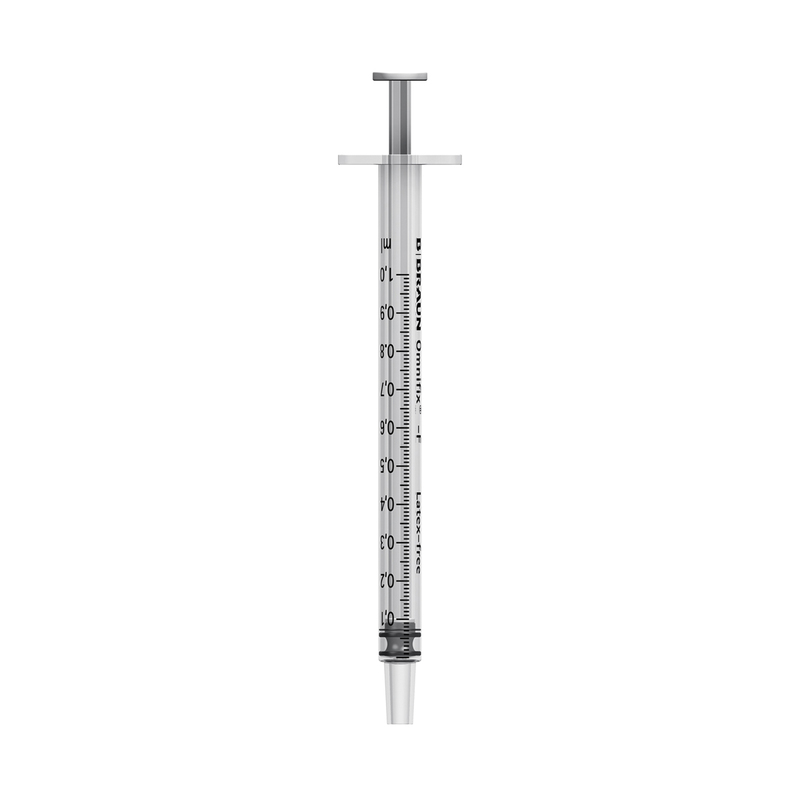 The finest needle used by adults for injecting is the 30 gauge needle size and this is the size of the needle on a nevershare syringe (needle length =12mm / ½"). To minimise vein damage, the needle of the nevershare syringe is cut at the same angles as a standard intravenous needle, and coated with a silicone lubricant. 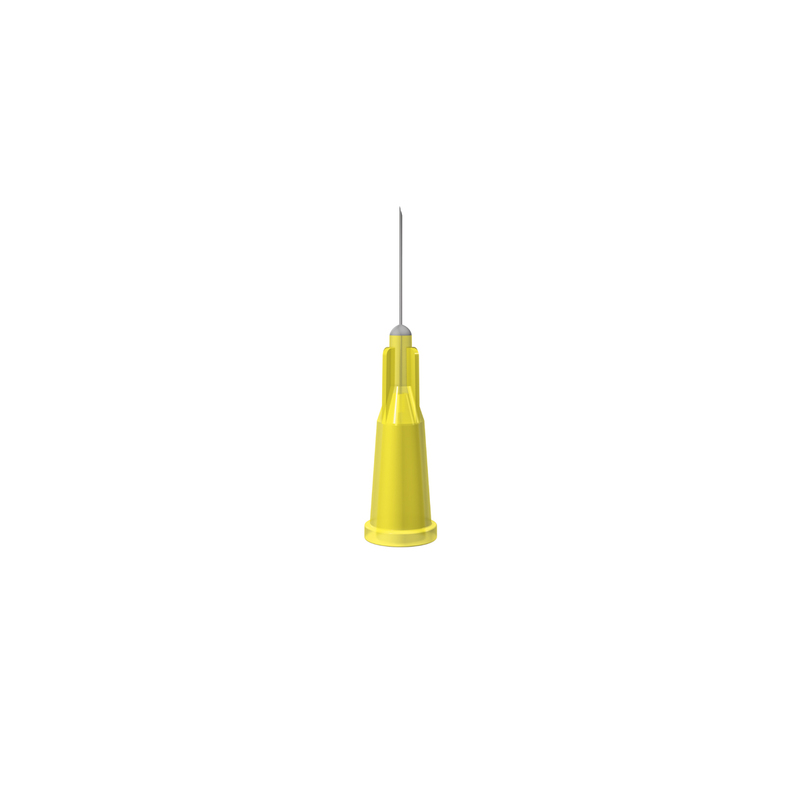 To withstand the forces applied during injection, the nevershare needle is made from the highest grade surgical steel, and manufactured to exacting tolerances. The combination of high quality steel and hi-tech manufacture gives the nevershare syringe greater strength and flexibility without fracture, than many 27 gauge insulin needles. Is the nevershare promoting syringe re-use? Like other syringes, the nevershare syringe is intended for single use. There is a clear ‘for single use’ symbol on every one. BUT, many syringes are being re-used. This combined with the common practice of ‘batch preparation’ of drugs means that accidental sharing is a major cause for concern. ensure that when re-using a syringe, injectors only re-use their own. Can I order from NHS e-direct? NHS e-direct unit of issue: 1,000. NHS e-direct unit of issue: 500. The main reason is lack of injecting equipment supply. There are approximately 130,000 people in the UK who currently inject illicit drugs, injecting on average 3 times a day. This means that there are around 142,350,000 injections per year... Needle and syringe distribution in the UK is probably around 35 million units per year – an average of barely one syringe per injector per day, and a long way short of one syringe per injection for everyone. Some injectors do use a new syringe every time, but for the large number who don't, they must re-use injecting equipment. Prevention of deliberate or accidental re-use of someone else's equipment is a priority for harm reduction services. Nevershare syringes will not necessarily increase the number of syringes available (and they're in no way designed to impede efforts to increase coverage and syringe distribution) but they should reduce accidental sharing due to equipment mix up, and may increase coverage by encouraging injectors to change behaviour and conserve their equipment. Even if we increase injecting equipment supply massively, there are still likely to be injectors who, because of social or geographical isolation or preference who continue to store and re-use injecting equipment and for them the mixed colours will remain a valuable tool to avoid sharing, and for those using a new syringe every time,the 'nevershare' branding reinforces this key message. is the nevershare a 'low dead space syringe'? The space between the end of the plunger and the tip of the needle is known as the dead space'. The volume of the dead space is important because after injecting it can contain blood (especially if the syringe has been flushed) and the risk of blood borne virus risk transmission with a shared syringe depends, in part, to the the 'dose' of viable virus that is delivered to the person. In a luer slip of 'high dead space' syringe (HDSS) there is much more blood than there is in a 'low dead space' syringe ((LDSS). This means that the virus can survive longer (because there can be a 'protective coat' of clotted blood), and that there is more blood and so more virus than in a low dead space syringe. It is possible for the needle of the nevershare to be removed, but the fitting is not a friction fitting like the luer slip - it is a snap fit mechanism developed for this syringe and, importantly, when the needle snaps onto the syringe part of the needle housing fills the inside of the syringe thus reducing it to almost zero. The nevershare is therefore a Low Dead Space Syringe (LDSS) with the same additional blood borne virus transmission risk as other fixed needle syringes, which is very much less than luer slip type syringes.